Are you mystified by math word problems? This easy-to-understand guide shows you how to conquer these tricky questions with a step-by-step plan for finding the right solution each and every time, no matter the kind or level of problem. From learning math lingo and performing operations to calculating formulas and writing equations, you'll get all the skills you need to succeed! 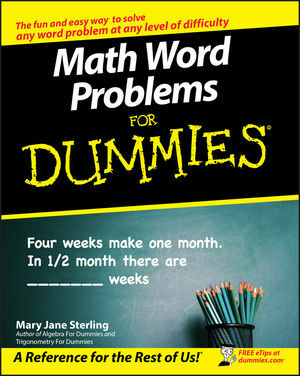 Mary Jane Sterling is the author of numerous For Dummies books. She has been teaching at Bradley University in Peoria, Illinois, for more than 25 years. Part I: Lining Up the Basic Strategies. Chapter 1: Getting Comfortable with Math Speak. Chapter 2: Planning Your Attack on a Word Problem. Chapter 3: Coordinating the Units. Chapter 4: Stepping through the Problem. Part II: Taking Charge of the Math. Chapter 5: Deciding On the Operation. Chapter 6: Improving Your Percentages. Chapter 7: Making Things Proportional. Chapter 8: Figuring the Probability and Odds. Chapter 9: Counting Your Coins. Chapter 10: Formulating a Plan with Formulas. Part III: Tackling Word Problems from Algebra. Chapter 11: Solving Basic Number Problems. Chapter 12: Charting Consecutive Integers. Chapter 13: Writing Equations Using Algebraic Language. Chapter 14: Improving the Quality and Quantity of Mixture Problems. Chapter 15: Feeling Your Age with Age Problems. Chapter 16: Taking the Time to Work on Distance. Chapter 17: Being Systematic with Systems of Equations. Part IV: Taking the Shape of Geometric Word Problems. Chapter 19: Going around in Circles with Perimeter and Area. Chapter 20: Volumizing and Improving Your Surface. Chapter 21: Ten Classic Brainteasers. Chapter 22: Ten Unlikely Mathematicians.